This is the first app store available on the market completely focused on and dedicated to the needs of Transport and Logistics industry, and made for the purpose of supporting efficiency of the companies’ operations. The goal of the new App Store is to provide our customers the possibility to offer specific apps to their fleet, to make even more efficient use of the fleet assets and improve overall business management. 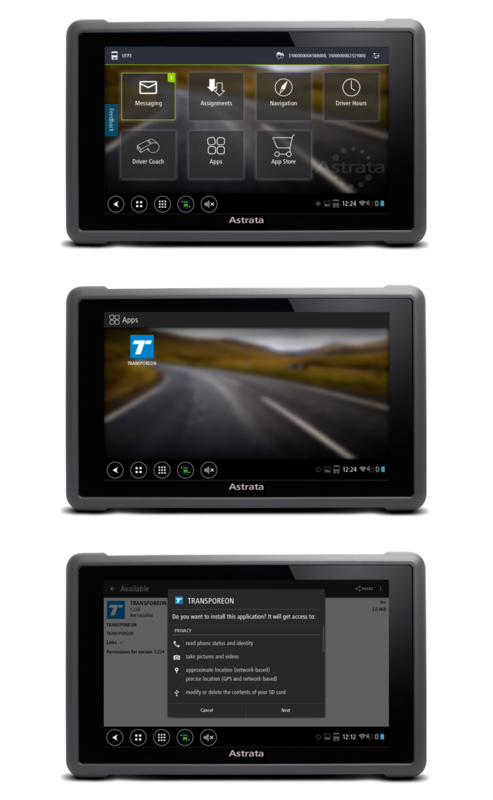 Astrata App Store is a folder available on the DriverLinc tablet, from which drivers can download and install available and approved applications. The customer can request Astrata to add any functional application to his App Store catalogue, whether it comes from shippers, software vendors or the transport company itself, in order to make it available to his drivers. 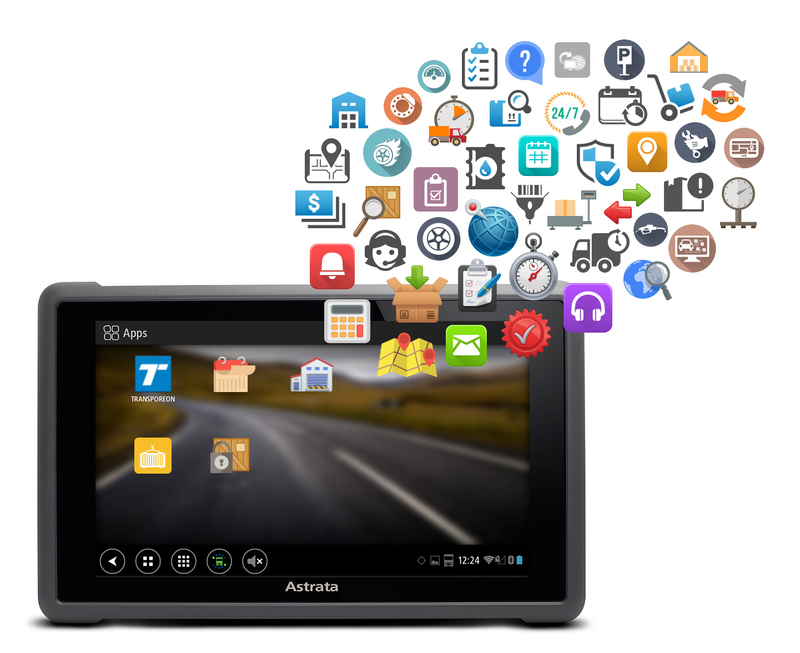 Once the services of Astrata App Store are activated for the customer, his drivers are then able to download the specified apps from the store and have them immediately available for use on their DriverLinc devices. Application that is available by default to all Astrata App Store customers if they require to use it. After an application is successfully installed from the App Store on DriverLinc tablet, the app icon will be visible for the driver in the Applications catalogue from where the service can be accessed and used immediately. All applications available via App Store can be updated to the latest version, which saves time and does not require additional manual actions. To keep costs better under control and limit unnecessary mobile data usage, the customer can restrict the installation and update of apps to happen over WiFi connection only. Next to this, the select number of default applications available to any customer on DriverLinc (Premium apps) will show up in the Apps folder, even if the customer does not have Astrata App Store service available. When the customer is using the App Store, these apps will also constantly be updated by App Store’s update functionality. Improved flexibility of daily operational processes and customer service. Integration of all software solutions and transport related data on one hardware device, also to fulfill 3rd parties’ business requirements and demands. Potential cost and time savings thanks to a wide variety of available Android solutions, allowing for example more accurate and secured workflow management. Reduced development costs during implementation of new solutions and processes as it uses the standard applications’ structure. More efficient and easier compliance with procedures thanks to the possibility to combine multiple 3rd party and in-house developed applications. Ease of use and faster operating system enabling drivers to speed up administrative work. Are you ready to embrace the benefits of your App Store? DriverLinc opens up a new generation of on-board computing and fleet management. It owns a robust and secure software and hardware that is easy to use while driving, in combination with premium and state of the art tools that offer process optimisation for drivers. The revolutionary tablet integrates an intuitive user interface design, out-of-cab usage and effective in-cab services. Offering mobile power to the customer's fleet and operations, it ensures a quick return on your investment. Learn more about DriverLinc here. Want to know more about what we can do for your company?